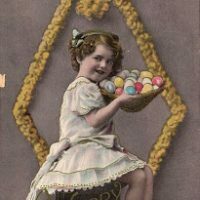 These are some fun Easter Stock Images from a Retro 1940’s Printer Book! Shown above are 3 cute Easter Baskets, in 3 different Colors, Lilac, Turquoise and Rose. Each basket is filled with Eggs and a Chocolate Bunny! These would make cute Tags! Adorable! Our church is hosting an Easter-themed dinner this year, and these would be perfect for place cards. Thanks so much!